Day 8: May 4, 2015. Today we visit Crete. This morning we were at sea so we had a briefing about coming excursions and a lecture about the glories of Greece. This afternoon we visited Knossos, then the Archaeological Museum in Heraklion. We had last visited Crete in 1998. 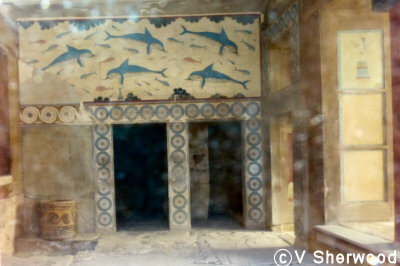 Knossos was much the same, although some rooms were no longer open to the public. The Archaeological Museum has been completely reorganized since we were there last. It is much easier to follow the chronology and the way artifacts are displayed is more interesting. 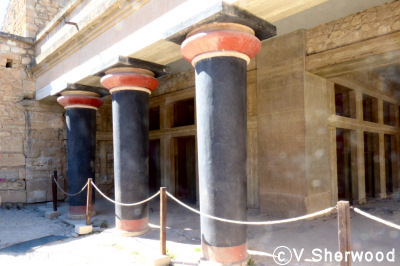 Knossos was built on a Stone Age site dating back to about 7000 BC. 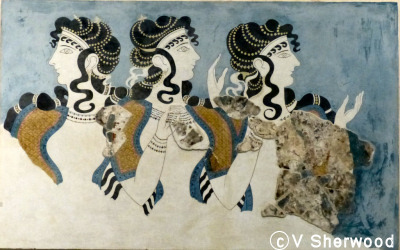 The Minoan Age dates from 3400 to 1600 BC. 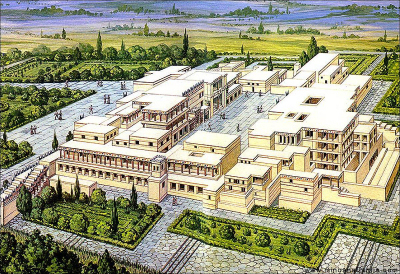 The palace complex of Knossos is huge. It contained 1300 rooms covering 24000 square metres. It was the political and cultural centre of the Minoan civilization and included administration, religious and storage buildings as well as the palace. 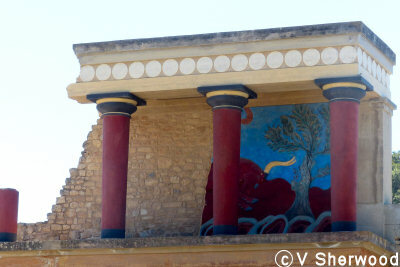 Knossos is situated 5 km south of the seaport of Heraklion. 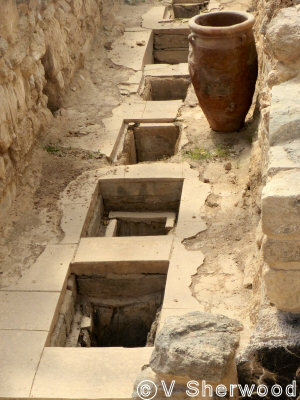 An aquaduct brought fresh water from Archanes, 10 km south of Knossos.There were also drainage and sewage systems. A model of the palace complex of Knossos. It was built on at least 6 levels. Light wells provided light for interior rooms. It was not at all like the Mycenean Greek acropolises which were built on top of steep hills and were walled. 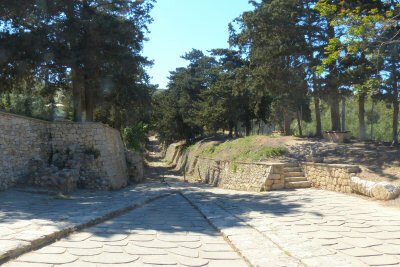 The "Royal Road" was the main road from the seaport of Heraklion to Knossos. 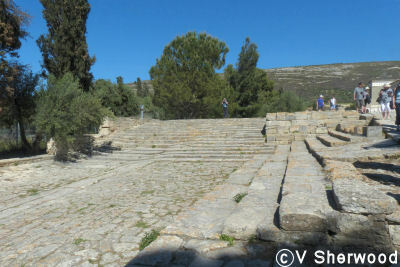 It entered the north side of the complex at the "Theatre" which might have been an audience platform.. The "Throne Room". The throne is made of alabaster. 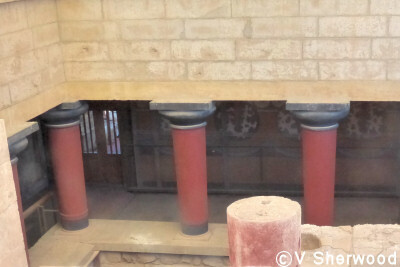 The columns on the right are typical of the Minoan era. They are not stone like Classical Greek columns but each column is made of a single cypress trunk. The trunks were set on the top ends to prevent them from growing; this is why the columns are wider at the top than at the bottom. Hall of the Double Axes. 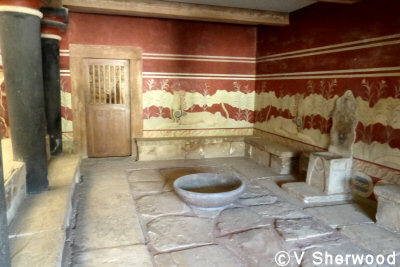 The Queen's Bathroom with the dolphin fresco. I found it this visit. A fresco of servants carrying jugs. 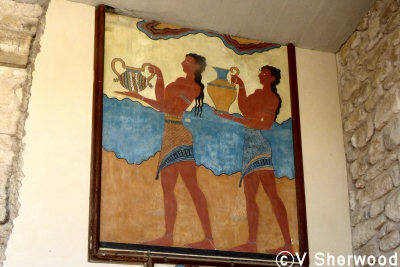 Another famous fresco, the Youth with Lilies, is on my Crete 1998 page. The fresco in the Archaeological Museum in Heraklion did not have the lilies (see below). 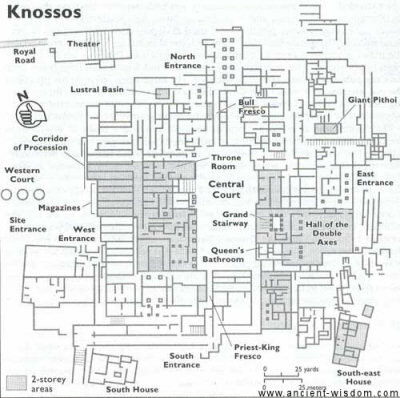 There are huge storage areas called magazines at Knossos. Grain was probably stored in the rectangular pits and olive oil and wine in jars. At the peak of the Minoan civilization, the palace complex and surrounding city had a population of about 100,000 people, which would require large stores of food. 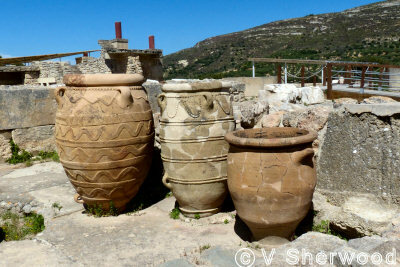 The huge pottery storage jars are called pithoi. 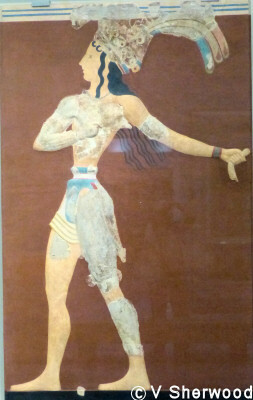 The Archaeological Museum in Heraklion has been completely reorganized since we were there last. It is much easier to understand the chronology of the various exhibits. 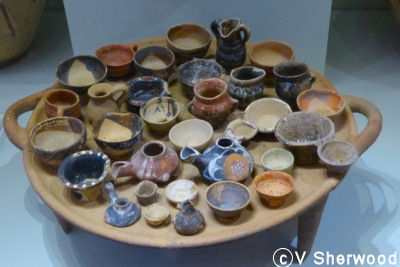 Minoan pottery. Some of it would not look out of place if in use today. 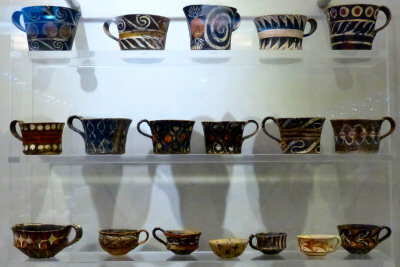 Minoan cups. Some were so thin that you could see light through the pottery. 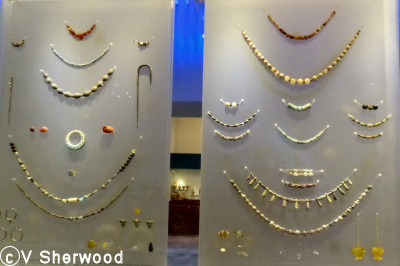 A display of Minoan jewelry. Some of it looked very modern. 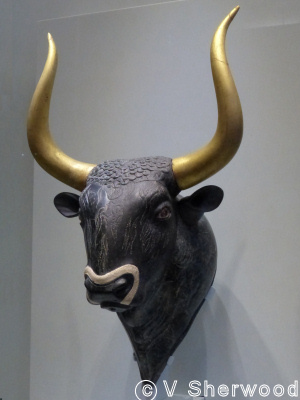 There are many representations of bulls. This is my favourite. I did not get a good photo of the fesco showing youths vaulting over a bull's back but you can see it on my Crete page. 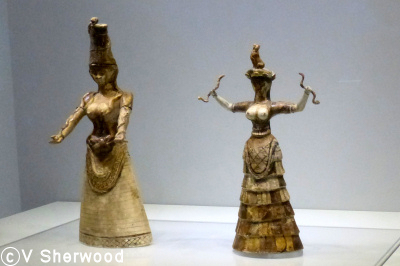 Statuettes of priestesses. The one on the right is holding a snake in each hand. Fresco of a priest king. This looks very like the Youth with Lilies but there are no lilies and the headdress is a bit different.